Per the Post: "Trump went off script and began describing details of an Islamic State terrorist threat related to the use of laptop computers on aircraft." Several national-security experts tell me that lives could well be lost as a result of an ISIS mole hunt that's sure to follow. And a key ally (the name of the country was withheld by the Post at the White House's request, but it's apparently in the Middle East) may deny future intelligence as a result of the episode. The N.Y. Times, which quickly confirmed the Post account: "[T]he ally has repeatedly warned American officials that it would cut off access to such sensitive information if it were shared too widely." He's cruising for a torrent of leaks from the intel community. The fact that several news organizations instantly confirmed the Post account is telling — and means the Hill will quickly know everything. Bragging can get you in trouble The Post reports: "Trump seemed to be boasting about his inside knowledge of the looming threat. 'I get great intel. I have people brief me on great intel every day.'" 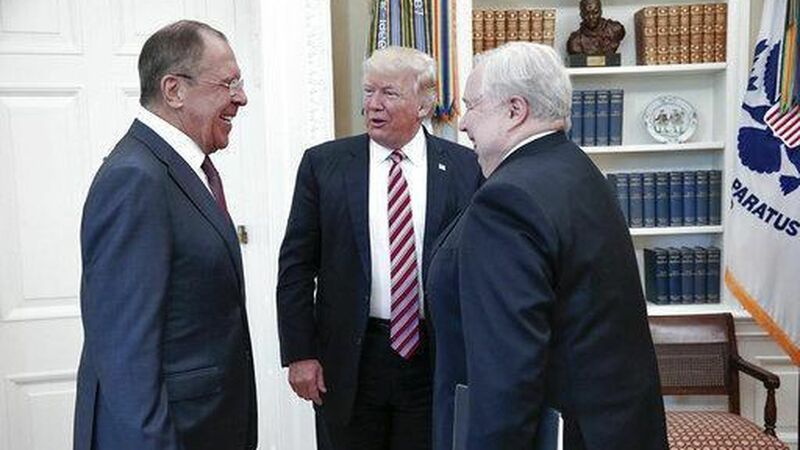 It shows how he thinks about Russia: He wasn't on his guard, wary that Russia can be an adversary with interests that differ notably from those of the U.S.
1 Axios screen, by Dave Lawler, to catch up. "Are you dealing with this WashPo story fallout at all? Trump admin official: 'No I'm dealing with other dumpster fires.'" "Per @TreyYingst, Bannon, Mike Dubke, Sarah Sanders and Spicer walked into cabinet room just now. They did not look happy." "Can now hear yelling coming from room where officials are." "WH comms staffers just put the TVs on super loud after we could hear yelling coming from room w/ Bannon, Spicer, Sanders." "CNN's Jim Acosta‏ (@Acosta): "Sarah H. Sanders told reporters she didn't know anything about yelling." Even many Republicans were aghast. Senate Foreign Relations Chair Bob Corker (R-Tenn.) said of the White House: "Obviously they're in a downward spiral right now and they've got to figure out a way to come to grips with all that's happening." Kirsten Powers on CNN, about people who always say the latest story is the worst thing Trump has done: "This is the worst. ... He has put people's lives in jeopardy." CNN Justice Correspondent Evan Perez: "[B]y revealing some bits of information, [i]t can tell the Russians that we have certain sources." Fox News' Jesse Watters, on "The Five": "The story is the leak." At 8:25 p.m., the banners on the cables stations were ... CNN: "WASHPOST: TRUMP SHARED HIGHLY CLASSIFIED INFO WITH RUSSIANS" ... MSNBC: "WAPO: TRUMP REVEALED HIGHLY CLASSIFIED INFO TO RUSSIANS" ... Fox: "LEFTISTS PROTEST GAY CONSERVATIVE JOURNALIST." Sean Hannity at top of his show: "I have a message for those of you who work in ... the White House: Enough with the self-serving leaks!" The One Belt, One Road project ("the new Silk Road") would connect about 65% of the world's population and a quarter of its GDP, according to McKinsey. P.S. North Korea likely suspect in ransomware ... N.Y. Times' Nicole Perlroth and David Sanger: "Intelligence officials and private security experts say that new digital clues point to North Korean-linked hackers." "Clinton did not reference Trump directly, ... but the group's mission statement takes an indirect swipe ... by noting she won almost 66 million votes in the last election. That's about 3 million more than Trump. Clinton ... vowed her organization would support specific groups that help Democrats. She singled out Emerge America, an organization that trains Democratic women to run for office, along with Color of Change, which promotes criminal justice reform and other racial issues." Tracking power ... Valerie Jarrett blog post, "Why I'm Joining ATTN: [mobile-first, issues-driven media company] as a Senior Advisor": "In a short period of time, they've shown the ability to move the conversation and spur action around important issues. ... I hope to help ATTN: continue to reach policymakers who want to get their message out to wider audiences." White House chief of staff Reince Priebus issued a stern warning at a recent senior staff meeting: Quit trying to secretly slip stuff to President Donald Trump. Just days earlier, K.T. McFarland, the deputy national security adviser, had given Trump a printout of two Time magazine covers. One, supposedly from the 1970s, warned of a coming ice age; the other, from 2008, about surviving global warming, according to four White House officials familiar with the matter. Trump quickly got lathered up about the media's hypocrisy. But there was a problem. The 1970s cover was fake, part of an internet hoax that's circulated for years. Staff chased down the truth and intervened before Trump tweeted or talked publicly about it. "Virginia's primaries both feature one candidate who preaches that the system is rigged while their opponents more or less are the system." "[I]t's not clear whether the populist message is a winner. In the GOP race, [outsider Corey] Stewart lags behind the favorite, longtime party strategist Ed Gillespie, an establishment Republican who focuses on smaller government." "[I]n the Democratic contest, [former congressman Tom] Perriello [who made a surprise challenge to the establishment] is in a tight race with his more staid and traditional rival, Lt. Gov. Ralph Northam." New WashPost poll: Gillespie 38%, Stewart 18%, state Sen. Frank W. Wagner of Virginia Beach 15%. 60% of likely Republican voters think Gillespie has the best shot at winning the general election. Quinnipiac poll last month: Perriello 25%, Northam 20%. Alec Baldwin: "[A]ll I remember is, 'Just try to make him unhappy.' There are many people who do Trump now, and they have different Trumps. They have kind of a 'balls-of-his-feet-light Trump' or what I like to call 'Gene Kelly Trump.' But my Trump is 'Miserable Trump.' No matter what. He wins, he loses, he's miserable." Melissa McCarthy: "[O]nce I heard 'motorized podium' and 'jewelry,' I said, 'Can he also be wearing a shoe?'" Fidget spinners have been around for years, mostly used by kids with autism or attention disorders to help them concentrate. But they exploded in popularity this spring. ... Unlike hot toys at the holiday season, which are often made by one company, manufacturers — mostly in China — are making the fidget spinners as fast as they can. Bonus fun thing ... "'Hangry' Passenger Orders Pizza Delivery to Stalled Amtrak Train": "A veteran pizza delivery man in Delaware got an order from an unusual address: an Amtrak train that got stalled on the tracks for hours on its way from New York to Washington." "Jim Leary ... cut through a backyard, navigated a steep embankment and jumped over a water-filled ditch all while balancing the two pies ... The 46-year-old Leary was rewarded with a cheering crowd of passengers and a total of $32 in tips."